NHK’s official twitter account is run by an announcer named Hori Jun. 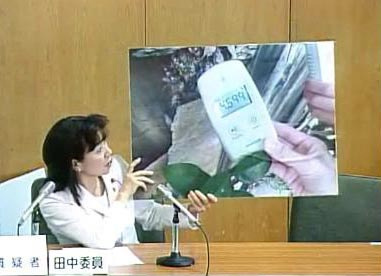 Since 311, NHK has been spreading lies and has killed millions of people by making them too late to escape. 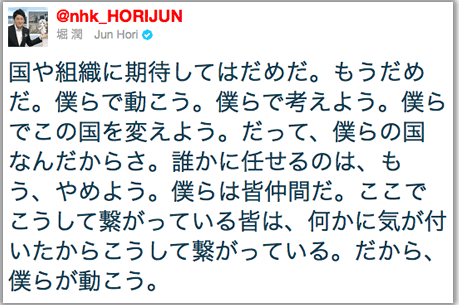 However, Mr Hori Jun tweeted comments that rebels against NHK. Because it’s an official NHK twitter account, it’s causing confusion but generally his comments were welcome as rare sanity found in mass media. A man (60) died during decontamination in Fukushima. Japanese government states it has nothing to do with decontamination, but they must show the basis to prove it really has nothing to do with decontamination. Even for Chernobyl accident, they are still studying the radioactive effects on humans. They must disclose information. We can no longer expect anything from the government or organizations. No, no anymore. We must move by ourselves. Let’s think by ourselves. We must change this country. This is our nation. We shall stop giving the power to someone else. Let’s rule ourselves. We are the one. We have realized “something”, that’s why we are connected to each other like now. so, let’s move. They are worried about his security. It has been discovered by TEPCO’s analysis that the significant amount of Reactor 1’s melted fuel pierced through the steel Reactor Pressure Vessel and dropped onto the Containment Vessel, then melted the concrete at the bottom of the CV. It is estimated that the melted fuel may have eaten into the concrete to maximum 65 centimeters deep. Maximum 65 centimeters deep from the bottom of the concrete floor, right? Well no. It’s 65 centimeters from the bottom of the deep groove on the concrete floor. And neither NHK nor TEPCO would bother to tell you how deep the groove is. ANN News from KHB Channel.8 months after nuclear disaster a Fukushima report was controlled by male on the bus after they passed 3-4 reactor probably heading to reactor Nr. 1 and dosimeters were showing 300 microsievert /hour. The limit for workers on the cite is 250 microsieverts /hour. Hear it by your self. Freedom of press? ‘Panem et circenses’ (‘Bread and circuses‘) desperately needs a few updates, because the people are starting to wake up. 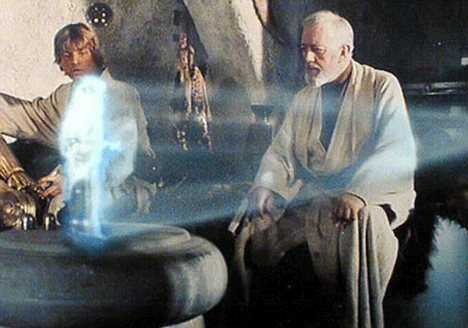 A hologram of Princess Leia appears in the film Star Wars. THREE-DIMENSIONAL television may be the latest in home cinema, but it will soon seem so 2010. Scientists are already planning its successor — holographic television. On a holo-TV, images will be projected into the middle of a room as a “cloud” that can be enjoyed from every angle without 3-D glasses. It may even be possible to broadcast concerts in other arenas around the world and to view live, lifesize sporting events in stadiums thousands of miles from the real players. NHK, the Japanese equivalent of the BBC, has committed to creating the first holo-TV within six years. It is sponsoring research at giant Japanese companies such as Sony and Mitsubishi and has dispatched engineers to America, where scientists have already generated basic holographic transmissions. It sounds like it won’t be long before holographic images can be projected into our living rooms as we are relaxing by playing cheeky bingo. This research is likely to revolutionise the way we view images and communicate with each other. The University of Arizona recently announced it had used lasers and powerful computers to generate single-coloured clouds of images. Nasser Peyghambarian, professor of optical sciences at the university, said adding colour and fluid movement was “closer than ever”. NHK has earmarked £2.8 billion for developing holo-TVs, as part of Japan’s bid to host the 2022 World Cup in Tokyo, but hopes to have prototypes working much earlier.